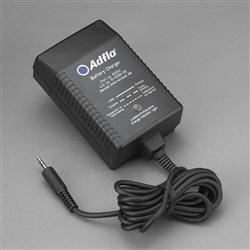 Replacement battery charger for 3M(TM) Adflo(TM) Powered Air Purifying Respirator (PAPR). Charges Adflo battery in less than 3 hours. "Smart" charger will not overcharge battery. Jaco Aerospace and Industrial is your one stop resource for 3M(TM) Adflo(TM) Battery Smart Charger, Welding Safety 15-0099-08 1 EA/Case and all of your 3M Products, Tapes, aerospace and industrial needs. SKU Marketplace Product Description: Replacement battery charger for 3M(TM) Adflo(TM) Powered Air Purifying Respirator (PAPR). Charges Adflo battery in less than 3 hours. "Smart" charger will not overcharge battery.